Stockholm is rising, constantly, out of the sea. As I wrote in my first blog post, Stockholm’s islands have been rising out of the water at a rate of about one centimeter per year since the last ice age ended; the land is springing back after bearing the weight of the ice for so many millennia. This continual rising of the land has played tricks on Stockholm’s historical landscape—navigational landmarks from the bronze age and seaside castles from the Renaissance are now sometimes miles from the water. As more and more land rises from the sea, islands become connected and what seems today to be one large island is made up of what was historically several islands; each part of the new mega-island generally retains its own unique island name. In a similar manner, islands become connected to the mainland. This is exactly what happened to the island of Djurgården, and this blog post is about the canal that was dug between Djurgården and the mainland in the 1830’s, turning Djurgården back into an island. Today, the canal is an iconic part of Stockholm’s recreational landscape, and the 5 kilometer loop at the canal’s edge is one of Stockholm’s most popular walking and jogging paths. Spring’s first sunny and somewhat warm weekend brings crowds of winter-weary Stockholmers to the canal—the paths are so packed with people that it’s hard to pass a slower walker. In my research, I learned that recreation and beautification are at the heart of the canal’s existence. The beginning of the 5km loop is at the edge of the city at Östermalm, and the far end of the loop is where the canal meets the open water. The island of Djurgården was used for agriculture for centuries under its various owners—first the crown from about 1100 or so, then Klara Convent starting in 1288, and then the crown again in 1452. Today, the island is still owned by the crown, but the crown’s agricultural pursuits ended in 1580 when King Johan III began to use the island as a royal hunting ground, giving the island its modern name of Djurgården or “Animal Park.” From the mid 1600’s, the hunting park was enclosed with a six foot tall fence, but the public was always allowed to wander through the gates for a small fee, even during hunts. Gatekeepers were employed by the crown and provided a minimal salary, but their main income came from the gatekeepers’ special right to sell alcohol from their gatehouses. This resulted in a lively pub culture where Stockholmers have travelled to Djurgården for weekend and holiday entertainments for several centuries. A few of these pubs are still in business, but even long-closed pubs remain in Stockholm’s consciousness through well-known stories, poems, and songs composed by Sweden’s iconic authors, poets, and songwriters over the centuries. Monarchs continued the hunting tradition on Djurgården until King Gustav III at the end of the 18th century; he was much more interested in arts and culture than in hunting. 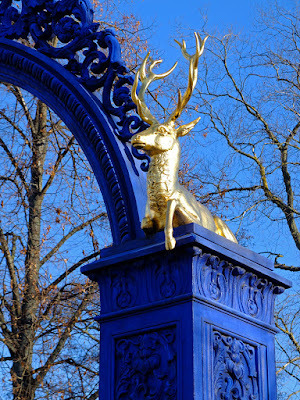 The last stags were moved away from Djurgården in 1829. During Gustav III’s time, Djurgården began a transformation from royal hunting ground to recreational area for Stockholm’s public, but it was really King Karl XIV Johan that created today’s park landscape. In the public’s eye, Gustav III actually did more to hurt Djurgården than to help it. He began to give away large parcels of land as estates to politically important allies, and these private estates were fenced off from public access. Because the island had always been used by the public, Stockholmers were upset about these developments. Immediately after Gustav III’s death, a public commission was established to regulate and administer the island, and a new law was passed that gifts of crown-owned land only lasted as long as the regent lived; the next regent has the right to take back such gifts. Just as Haga Park is the result of Gustav III’s epoch, his politics, his interests, and his whims, so is Djurgården a product of Karl XIV Johan’s politics, interests, and efforts. As I wrote here, Karl XIV Johan was imported from France to be Sweden’s king. He was chosen due to his successful military career under Napoleon, and much of his focus as regent was on modernizing Sweden’s military. I am sure that the fact that he was enormously wealthy didn’t hurt his case in being chosen as monarch considering that Sweden was painfully cash poor at the time. Karl XIV Johan brought his personal wealth to Sweden and proceeded to invest his funds in a variety of projects. All of the work at Djurgården was privately financed by the king, not through the public treasury. 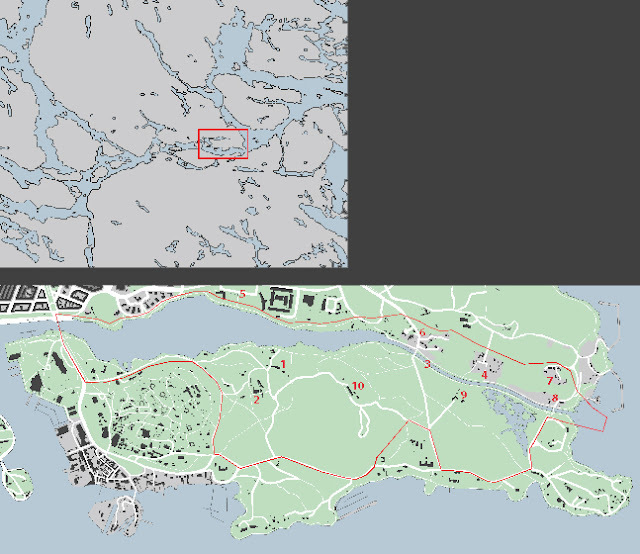 Karl XIV Johan bought a modest country estate called Rosendal (map 1) on the island of Djurgården in 1817. We don’t know exactly why he chose this location, but it seems plausible that the new king felt a need for a fresh start and didn’t want to be associated with the tumultuous events surrounding Gustav III and Haga Park. Like Haga, Djurgården was an easy commute from the city, but it was in the opposite direction from Haga and had never been the focus of other regents. 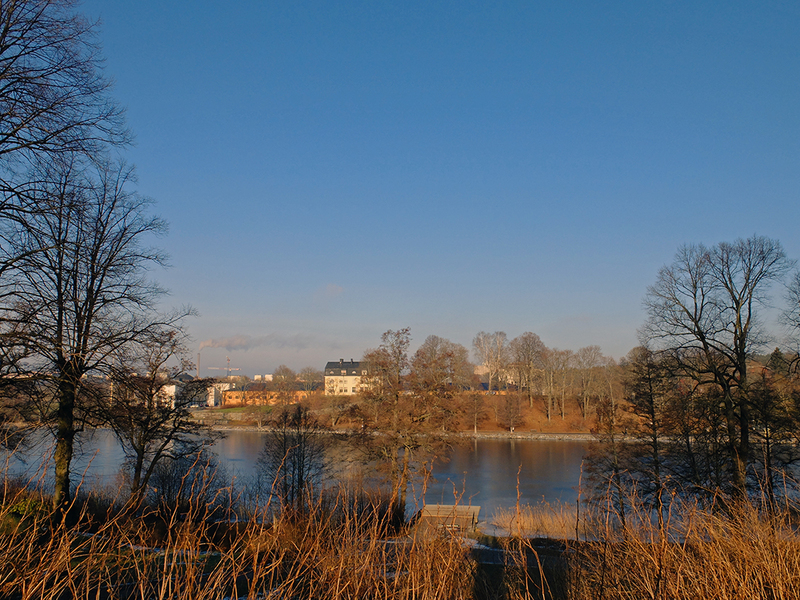 The estate is also directly across the water from the military parade field Gärdet. The military-interested king could watch the military exercises from his new estate, and he even had a pontoon bridge built over the bay in 1828 so that he had direct and easy access. The king was content to live in the modest house at Rosendal, but he immediately began improving the grounds. 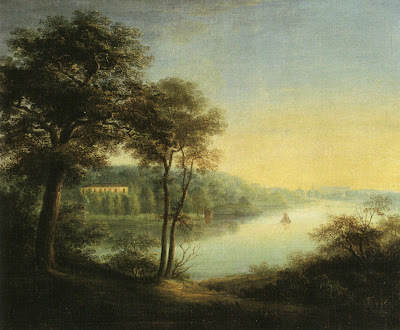 His first action was to remove the fence around the estate, giving Stockholmers free access to roam the grounds once again. This action was a politically shrewd move and gained him much support. All of his further improvements of the park were twofold, both to create beautiful surroundings for himself and for his family, but also to provide Stockholm with a beautiful park for exercise and leisure. In this way, the creation of Djurgårdens park landscape was very much a political statement as King Karl XIV Johan professed himself to be both “of the people” and “a servant of the people.” In this light, it is not too surprising that the Swedish people accepted this random, non-noble person as their leader and king. It is unclear if the park was designed by any one landscape architect or if it just developed over time—there are no known comprehensive proposals or drawings remaining today. 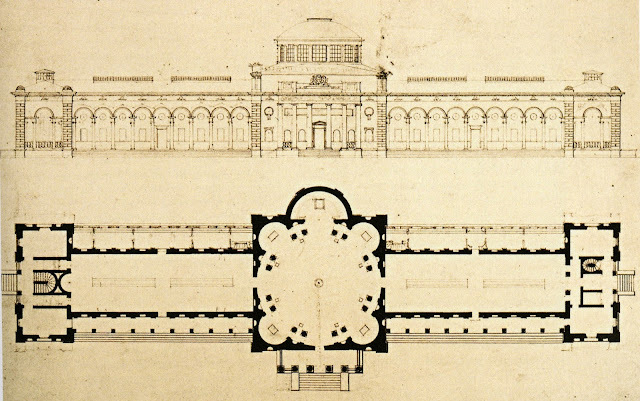 One drawing for the gardens nearest the Palace shows how an earlier proposal for a formal, geometric design was overplayed with a more modern, informal curving design. Djurgården’s park is a product of the English Romantic landscape movement. Even though the park looks natural, it was sculpted and designed by man. Trees were felled to create sight lines, undergrowth in the forests was cleared to create more open and welcoming woodlands, and new trees were strategically planted to shade the winding paths and to create visual backdrops. Existing roads were widened and new walkways were created, and variation was key—sometimes the paths were shaded, sometimes in open sunlight; sometimes they went through forests, sometimes through grassy meadows; sometimes they climbed uphill, sometimes they went downhill; sometimes they passed through formal gardens, sometimes through wildflower meadows. Bedrock was blasted and low areas filled in to create gentler slopes. Karl XIV Johan’s efforts lasted 25 years and exceeded Rosendal’s boundaries. By the time of his death, the park landscape extended across a large part of the island. 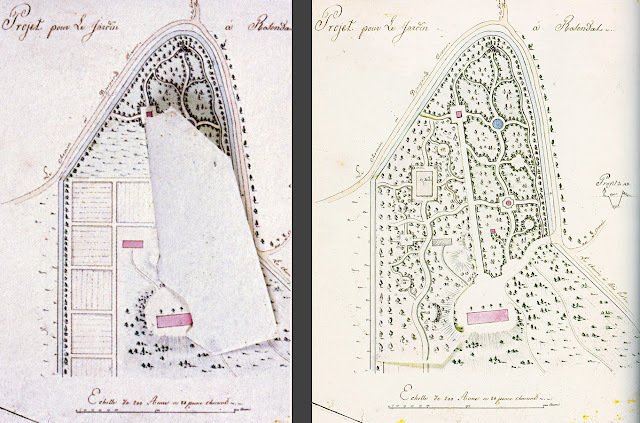 Most Stockholmers today would associate the name Rosendal with the estate’s gardens and greenhouses (map 2) before the Palace came to mind. After King Karl XIV’s death, the new regents King Oscar I and Queen Josephina were very interested in gardens, and their focus lay much more with flowering gardens than with more generalized park landscapes. In 1850, a large “winter garden” designed by Chiewitz was built on the Rosendal grounds, and a number of more utilitarian greenhouses were built to extend Stockholm’s short growing season. After Oscar I’s death, the greenhouses and gardens were rented out to the Swedish Gardening Association Svenska Trädgårdensföreningen for a period of fifty years, but the gardening association never managed to make the enterprise profitable. When the lease ran out, the gardens and greenhouses were then rented out to private entities, but none of these enterprises were very successful, either. Starting in 1984, a non-profit public-private initiative was founded. Stiftelsen Rosendals Trädgård does hands-on research on organic gardening methods; maintains traditional strains of fruits, flowers and vegetables for biological diversity; sells organic fruits, vegetables, breads and other goods which come from the gardens; plants gorgeous pick-yourself flower gardens; and operates a wildly popular garden café and restaurant which specializes in organic and locally grown foods. Somewhat ironically, this non-profit organization seems to be running a much more profitable garden business than any of the previous for-profit tenants. Left: The Winter Garden has long since been converted into rental housing. Right: One of the cozy garden tables at the Rosendal Café. The canal, Djurgårdsbrunnskanalen (map 3), was a key part of the island’s transformation. Historically, Djurgården had been an island and the water passage between the island and the mainland was navigable. In the mid-1600’s wooden poles were driven into the waterway so that ships could no longer avoid the toll station (Stora Sjötullen) on Djurgården’s southern shore. However, by the mid 1700’s, the land had risen so much that the waterway disappeared and Djurgården was now connected to the mainland. A swampy area called Isbladsträsket formed because water had no natural way to drain out from this low area. The popular myth among Stockholmers is that the canal was built in order to keep the deer, moose, stags, and reindeer on the correct side of the royal hunting ground, but this is not true since the hunting ground hadn’t been in use for about 50 years when the canal was dug. Instead, King Karl XIV Johan had the canal dug for other reasons. Firstly, malaria was a real problem in Stockholm at the time, and the swamp at Isbladsträsket was dangerously close to Rosendal. The king wanted to drain the swamp to protect his and his family’s health. He hired the Göta Canal’s engineer Carl af Forsell to dig the old boundary between Djurgården and the mainland. Naturally, the canal wasn’t meant to be purely practical; its parallel paths were planted with trees and its romantic curves were incorporated into the park landscape. The canal ended up being an expensive affair—it took 10 years to build and wasn’t finished until 1834—but the expense was worth it because the canal has been an iconic and popular part of Stockholm’s recreation for almost 200 years. The health spa's main building burned down in 1988 but the director's villa from 1929 and the warm bathhouse from 1832 are among the surviving buildings which have been converted into coveted rental housing. 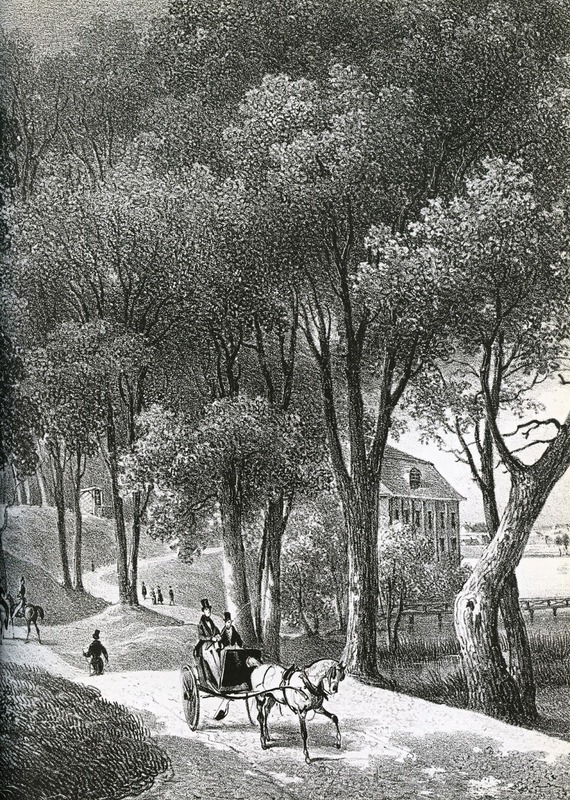 and at Källhagen (Spring Pasture) in the early 1800’s (map 5). However, the swamp’s disappearance and the new canal’s romantic waterway made a lot of real estate newly valuable. Today the swamp is back! In an effort to restore the valuable bird nesting site, the city has stopped pumping water out of the swamp and into the canal. In thanks for his efforts, the king gave canal engineer Carl af Forsell the use of several estates across the water from Djurgården, and Forsell built himself a summer house at the newly established estate of Rosenhill in 1826 (map 6). 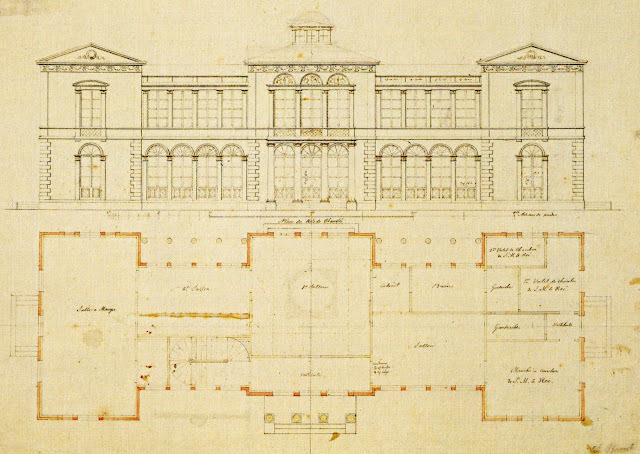 In 1827, Forsell sold the lot next to his house where the Ekmarckska House was designed by Fredrick Blom, the same architect who designed Rosendal Palace (actually, the Ekmarckska House is so like Blom’s first proposal for Rosendal Palace that I wouldn’t be surprised if he had recycled the same drawings for this private villa). Rosenhill to the left and Ekmarckska to the right. Just to the east of Rosenhill, Forsell built two summer villas which he rented to other private people. One of these rental houses was replaced in 1890 by a new summer cottage, Villa Rosenhill. 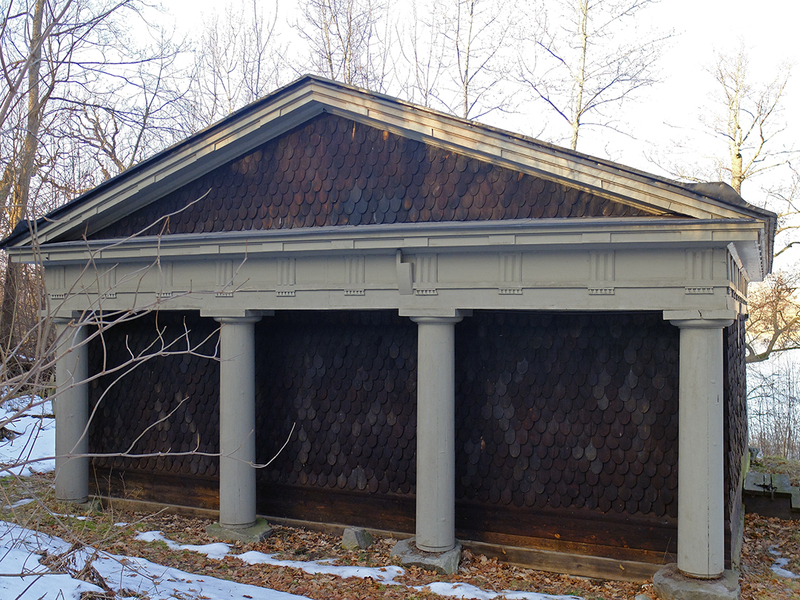 Several storage buildings on the estates have been since rebuilt into year-round residences. Rental cabin to the left and Villa Rosenhill to the right. Further down the canal, several more summer estates were built in the 1830’s by wealthy private individuals. Villa Lido was designed by architect Carl Christoffer Gjörwell and Bergshyddan was probably designed by Fredrik Blom. Villa Lido to the left and Bergshyddan to the right. More villas and a tower were also probably designed by Blom at Fridhem, although these buildings have undergone extensive renovations (map 7). The tradition of building private summer estates on the north side of the canal continued throughout the 1800’s as evidenced by Johanesdal which was built in 1851 (map 8). Eventually, all of these summer “cottages” were winterized and today they are inhabited year-round. A more recent addition includes a modern house that has views out over both the canal and the open water beyond. These private estates north of the canal are at odds with King Karl XIV Johan’s efforts to open up Djurgården as a public park, and I’m not quite sure how to reconcile their existence with the king’s obvious efforts to ingratiate himself in the public eye by symbolically doing away with private land on Djurgården. Perhaps he felt that giving “military” land away was not as terrible as giving parkland away. Whatever his reasoning, it is notable that these estates are not actually on the island of Djurgården and that most of them do not interfere with the public walkways at the canal’s edge. Today, however, they create a strange band of private land separating the public canal walkway and the huge public park at Gärdet. These private estates create a very different atmosphere from one side of the canal to the other. The southern, Djurgården side of the water feels wilder, more natural, and distant from the city. 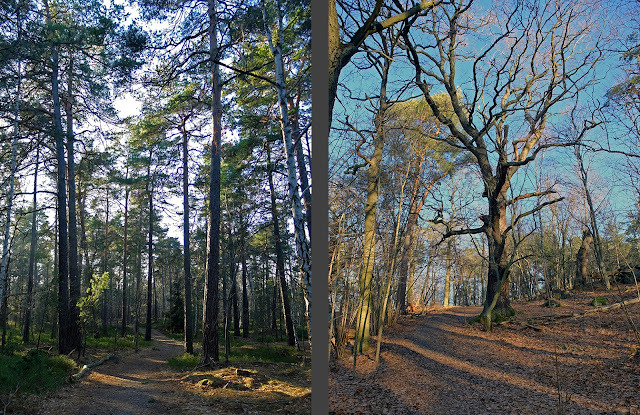 On the northern, Gärdet side of the water, the paths feel more like a city park and are even partly paved in contrast to the southern side’s gravel paths. While the focus on the southern side is more on nature, the northern side has a much more social atmosphere. This social feeling is of course further strengthened by the restaurants at Djurgårdsbrunn and at Källhagen; the row of museums featuring Maritime History, Technology, and Ethnography; and the physical nearness of the neighborhood of Östermalm. 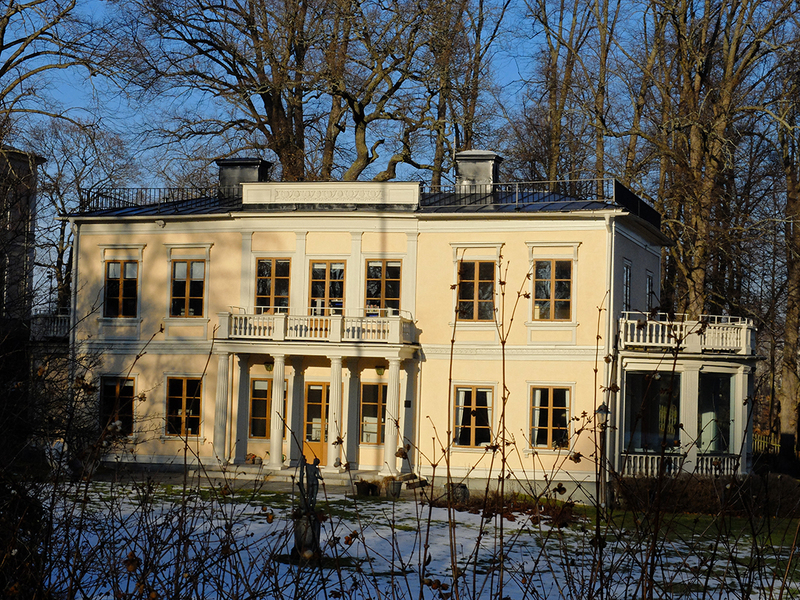 There are a smattering of private estates on the Djurgården side of the waterway, but these were all built well after King Karl XIV Johan’s death in 1844. The one exception is Gröndal (map 9), but it was already in private hands before Karl XIV Johan began his project at Rosendal. Gröndal had originally been built in the 1700’s and used by one of the royal hunting ground’s employees, but it was completely rebuilt in the 1820’s. Building a new royal palace at Rosendal was not the king’s priority or intention. For official functions and entertaining, Stockholm Castle and Drottningholm Palace were already more than sufficient. Rosendal was a family retreat and the king was content with the relatively rustic farm estate house until it burned to the ground in 1819. None of the plans for the new palace were overly ostentatious. 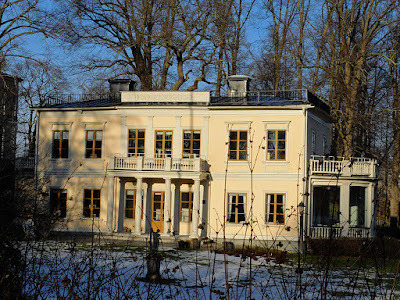 While the palace is of course larger than the average middle class home, it is far smaller than many non-royal estate houses in Sweden. Instead of quantity, the king chose to focus on quality and he set out to prove that Swedish products were every bit as beautiful, luxurious, and worthy as their French counterparts. Rosendal Palace became a showcase for Swedish industry and craftsmanship. 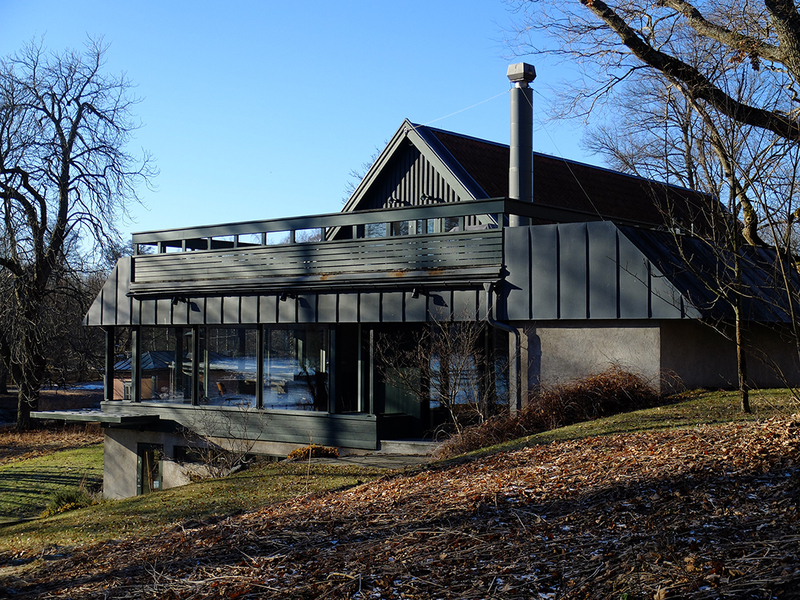 but he was quickly replaced by architect Fredrik Blom whose drawings are less monumental in character. Instead, Blom’s first two proposals are distinctively “summer pavilions” with largely glass facades. Blom’s third proposal was less decorative and is more climate-realistic with much smaller windows. It is this third proposal that was built. Although Blom’s palace looks like a stuccoed stone building like just about any other French or Swedish palace, it is actually a log cabin structure covered in stucco. Log cabin technique had been the main building technique in Sweden for at least a millennia. 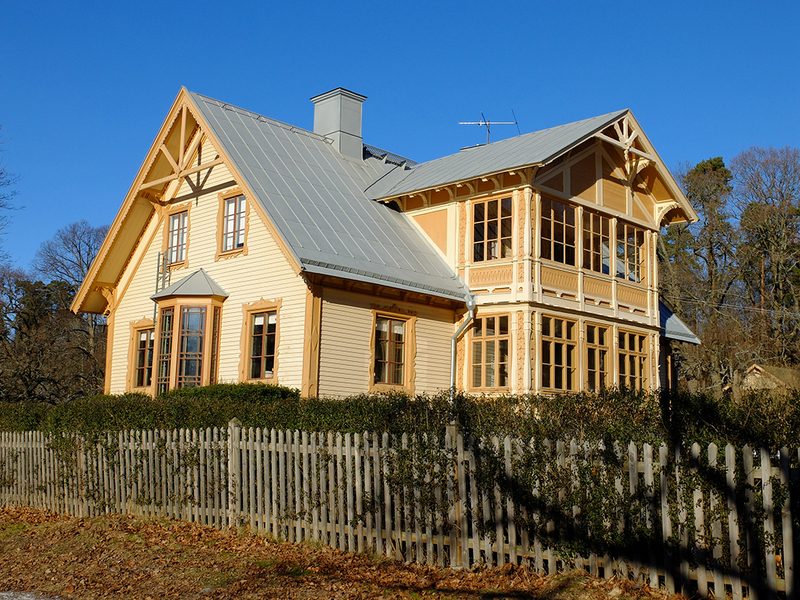 Wood is generally abundant in Sweden, solid wood walls are good insulation against the winter cold and wind, the logs last for centuries (there are still log cabin buildings dating from the 1200’s in Sweden), and log cabin buildings are relatively easy to move from one site to another as needed. Moving log cabins around sounds like a lot of work to us today, but it was in fact a common occurrence through most of Sweden’s history. In short, King Karl XIV Johan chose to highlight a traditional building technique, showing that it could be just as luxurious as stone. 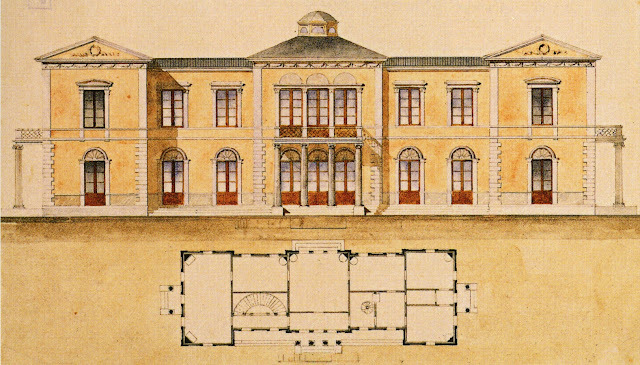 Not only was the palace’s construction system uniquely Swedish, but the exterior detailing was also Swedish. The marble colonnade is from Kålmorden and the amusingly oversized vase in the garden was carved from one piece of Swedish porphyry stone. 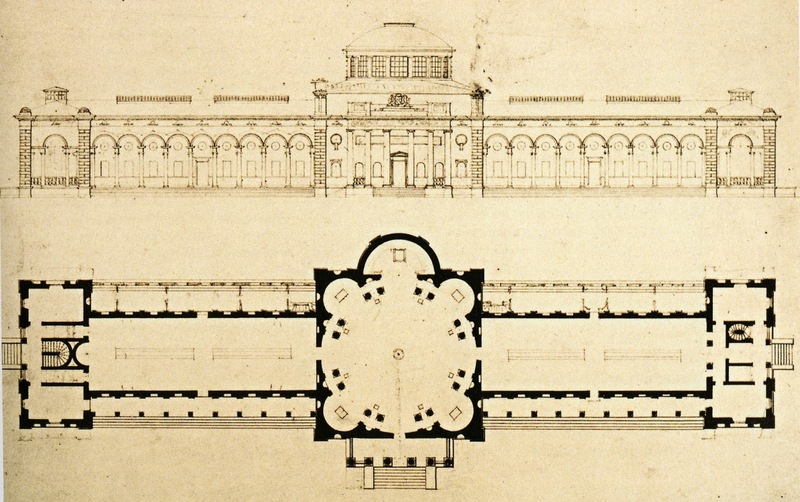 Construction of the palace was finished in 1825, but already in 1826 Blom was hired to design an expansion. The palace’s dining room was beautiful, but it was not functional as many back-of-house functions for storage etc. were never included in the design. The new addition would house a large dining room as well as all of the necessary back-of-house spaces. The dining room addition was a hard assignment given how symmetrical the original palace building was. 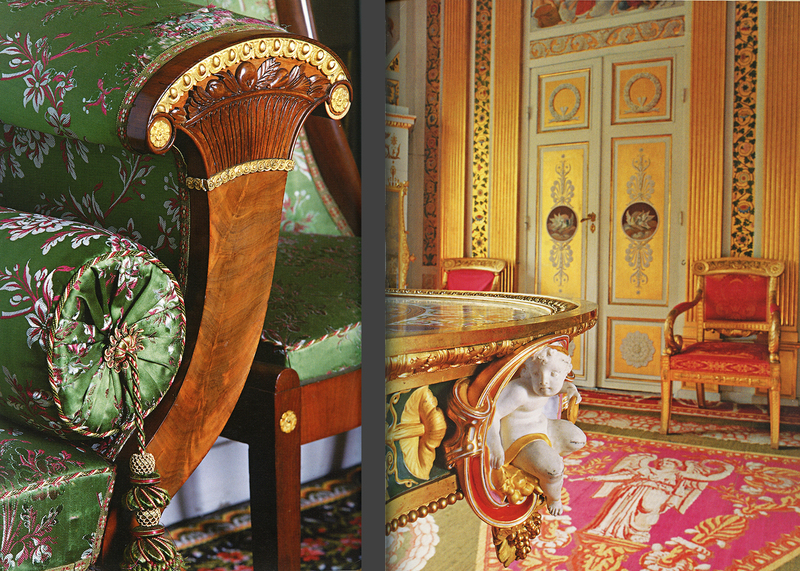 Instead of matching the palace, Blom decided to accent the dining room’s differentness. 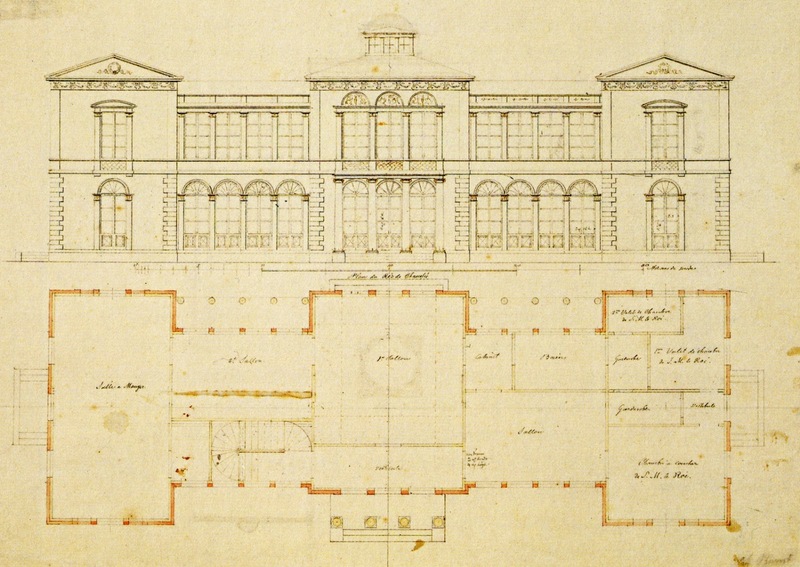 Instead of a solid, permanent building like the palace, Blom designed a light, pavilion-like dining room which was actually more in keeping with his first proposals for the palace. This glassed-in dining room became a theatre where the King and his family ate on display before all of the Stockholmers who gathered outside the windows to watch the king eat his meals. The dining room stage reinforced the King’s political message that he was of and accessible to the people. The dining room addition is all closed up for winter in this photograph, but during King Karl XIV's day, the public could peek through the windows to watch the king and his family dine. 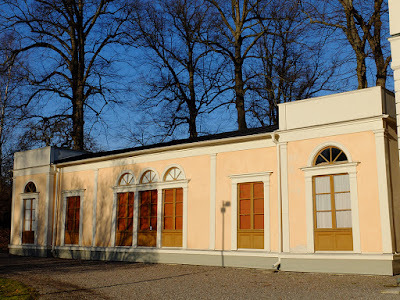 Just as the Haga Pavilion was the benchmark for Gustavian interior design, King Karl XIV Johan understood that Rosendal Palace would become the new model for interior design and goods. Instead of importing French luxury goods, he bought a few example pieces—silk from Lyon, gilded chandeliers from Paris—to be used as models for Swedish production. Essentially, the king single-handedly set the entire Swedish industry for producing luxury goods in motion. If the king had imported pieces from France, the copy-cat nobility would have done the same. But since the king made a point of buying from Swedish producers, the nobility and middle classes followed suit. Gustavian Neo-Classicism with its delicate forms and pastel colors was replaced by a heavier Empire Style influenced by Napoleonic France. The Empire Style featured bolder, darker colors and to me seems almost to transition into the Victorian era’s darker tones. Several of Rosenda’s outbuildings were already in place before the Palace was built such as the kitchen buildings which were original to the estate. The Officer’s Pavilion was designed by Lidströmer and built in 1820 to house the King’s guard while he stayed at Rosendal. The so-called Queen’s Pavilion was designed by Lidströmer and quickly built after the Rosendal house burned down as a provisory retreat for the King. The Queen’s Pavilion was originally only one story but a second story was added just a couple of years later. The kitchen, the Officer’s Pavilion, and the Queen’s Pavilion are all rented out as private homes today. 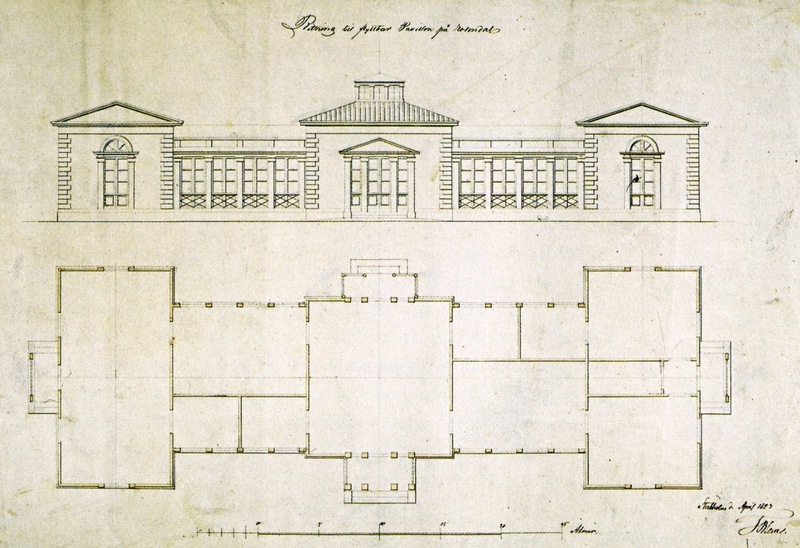 and the Horse Stall (map 10) which was designed by Blom and built in 1836. 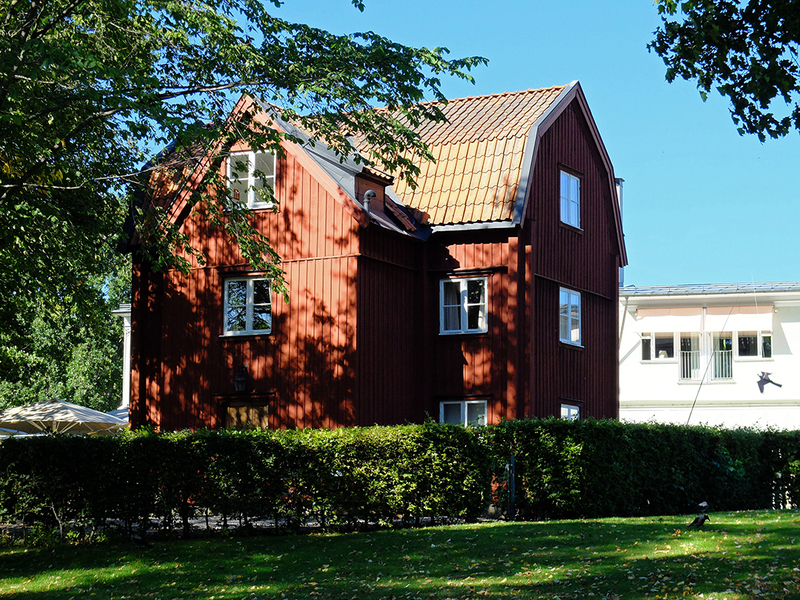 The horse stall is still used today and many of Djurgården’s trails are specifically maintained for horse-use. Interestingly, while the King’s vision for his palace was not about grandeur, he did have grand plans for an art museum on the grounds. Gustav III had also toyed with the idea of a sculpture museum at Haga, but those plans were never realized and Sweden was still embarrassingly art museum-less. Parliament did not support the idea of building an art museum because museums were seen to be upper class, capitol city diversions that did not improve the conditions of the working class throughout most of Sweden. 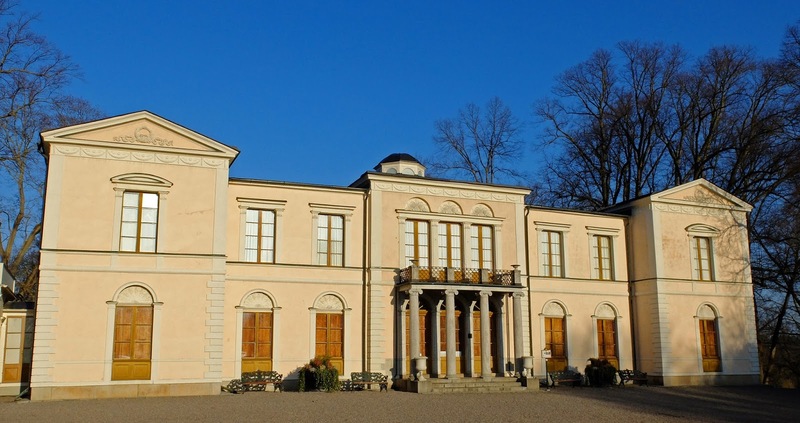 Sweden’s castles and palaces were already overflowing with paintings and sculptures when King Karl XIV Johan brought his large personal art collection from France. Once in Sweden, the king continued to collect and even to commission new works of art, and the need for exhibition space grew acute. 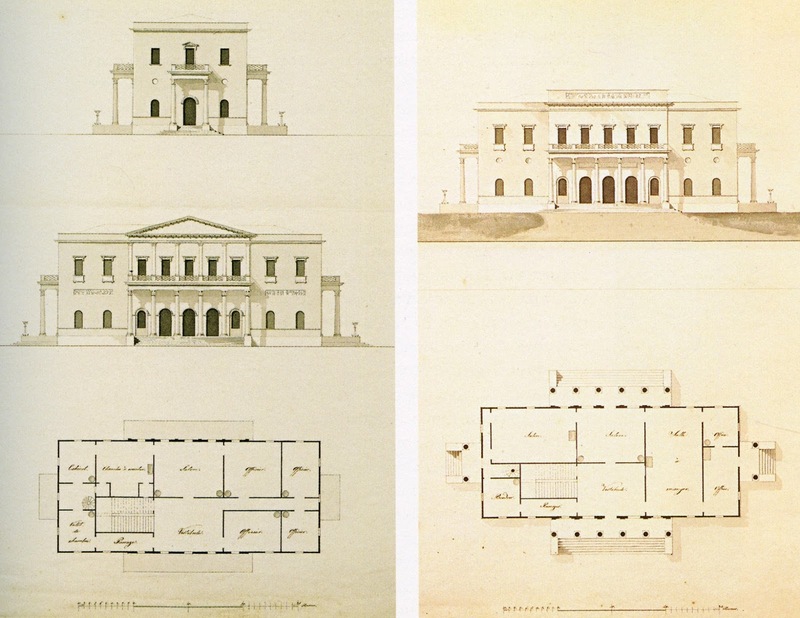 Despite Parliament’s misgivings, Karl XIV Johan commissioned drawings for a sizeable museum. 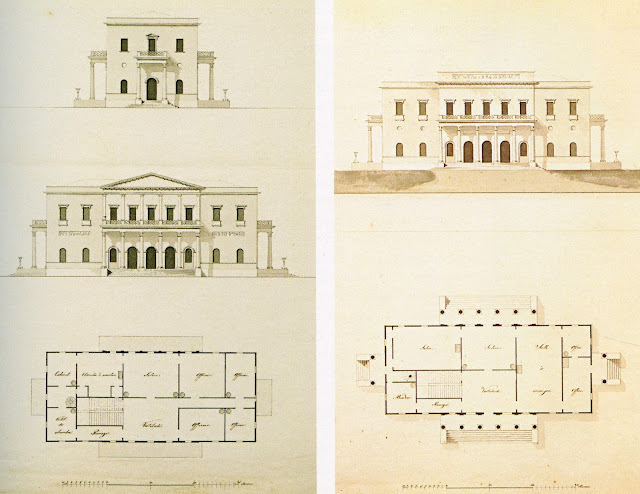 Blom’s drawings from 1836 are heavily influenced by other European museums such as the Uffizi in Florence and Soane’s Dulwich Picture Gallery and show a long, narrow building with a domed central pavilion. Sculpture was to be housed in the central pavilion and the long wings were meant for paintings. In 1834, construction work began: the foundation was dug and marble columns (Swedish, of course!) were carved and transported to the site. However, the king seems to have slowly lost interest in the project, and construction work tapered off. By 1841, no more orders were signed and the project was forgotten. Another half century would pass before Stockholm finally got its first national art museum. I originally intended to focus this post on the Djurgården Canal, but it soon became apparent that the canal is a small puzzle piece in a much broader historical, architectural, and political context. King Karl XIV Johan’s decision to buy Rosendal and to re-open much of Djurgården’s landscape to the public was the key to today’s lovely park landscape on Djurgården; today the entire island is part of the world’s first National City Park. While the winding canal and its tree-lined paths are only a small part of the island, they symbolically represent the park in the city’s public consciousness. 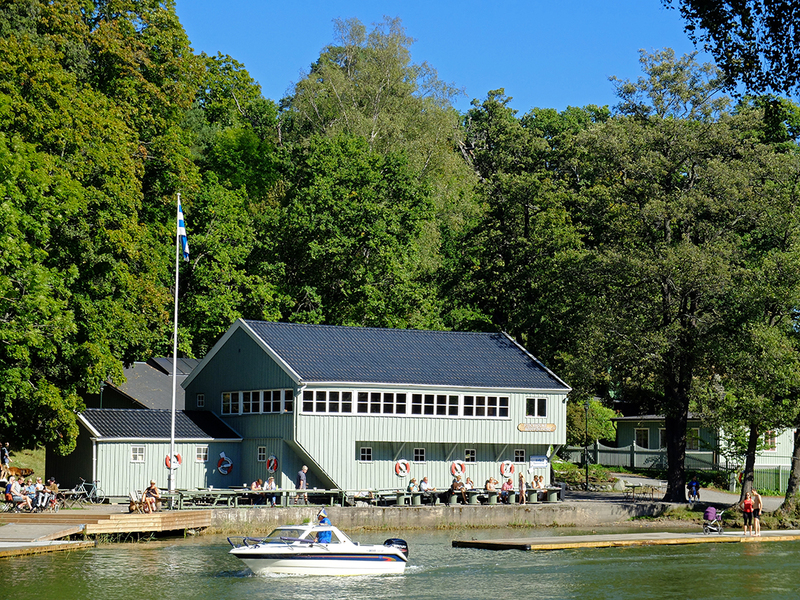 Other parts of the island get a good bit of use (especially the garden café at Rosendal), but other walking paths on Djurgården are not used at nearly the same level as the canal-side paths. To my knowledge, the island of Djurgården was the first park in Stockholm that was created specifically for the goal of public use.